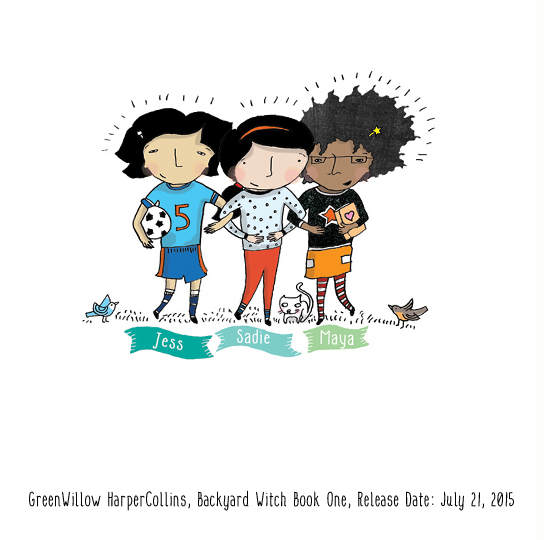 Sadie’s Story – Sadie has two best friends: Jess and Maya. But Jess can only take one friend on vacation with her, and Sadie is the one who gets left behind. How will she ever survive the days of loneliness and boredom? But wait . . . what is that in her old playhouse in the backyard? A witch has moved in! A kind and funny witch, who’s looking for her own two lost friends. Together, Sadie and the witch have a curious adventure, one that makes Sadie see her neighborhood—and herself—with new eyes. Jess’s Story – Jess is a superstar on the field and on the court. Soccer, basketball, baseball, tennis—you name it, she loves it. But she’s a disaster in the kitchen, much to the dismay of her chef mother. When Jess’s mom gets a chance to work in a famous kitchen for a week, Jess and her friends, Sadie and Maya, try to help out by making dinner. And . . . let’s just say that it goes up in flames. Enter Ms. M, the mysterious witch who appears right when you need her! Ms. M is a heroine to rival Mrs. Piggle-Wiggle and Ms. Frizzle. She doesn’t save the day herself, but she helps everyone save it for themselves. Maya’s Story – Maya has been preparing for the school spelling bee F-O-R-E-V-E-R. She spells every unusual word she hears, and even enlists her best friends, Sadie and Jess, to help her practice. But on the day of the bee, something terrible happens—Maya loses. To Sadie. Enter Ms. M, who is substituting for the school librarian. Ms. M always knows just how to make everyone feel better . . . but she also always brings a little mischief. This time it involves a library poltergeist and an imaginary chicken! Backyard Witch is written by Christine Heppermann and Ron Koertge and illustrated by Deborah Marcero.